In 1968, Honda revolutionized the motorcycling world with its famous 750cc four cylinder machine. Six years later, the number one of the Japanese industry, having just weathered a downturn following retirement of its founder Sochiro Honda, bounced back with the astounding Gold Wing GL 1000. 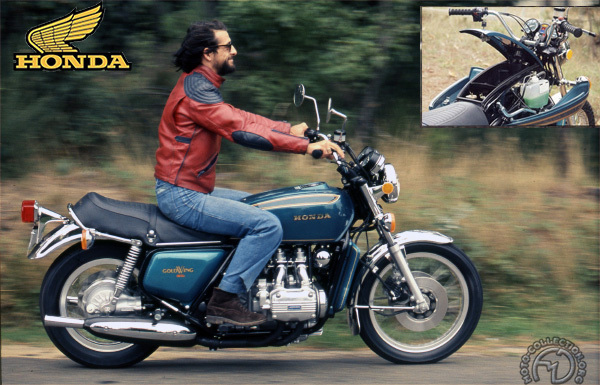 The GL followed the very wise philosophy that then ruled Honda in being a bike that was both clean to ride (shaft drive) and silent (water cooled), but it was also technically advanced. The camshafts of its flat four were driven by cogged belts and the fuel tank was under the saddle. It was rumored that the project design had been subcontracted to Porsche and that the original prototype had been fitted with an air cooled flat six like the famous Porsche 911 car. Whatever the truth of that, the original GL 1000 made a name for itself as a high class touring bike - its amazing career ran for nearly twelve years following its introduction in 1975. it underwent regular improvements in which its power unit was progressively developed from 1000cc to 1100cc then to 1200cc becoming ever more imposing and increasingly "Americanized". The final phase came in 1988 with the introduction of a flat six engine. The Gold Wing, which already had an imposing list of owners was all set for a new career.